When putting crossed braces on a structure to keep it from racking (as used when making a trestle), the most important lashing is the diagonal lashing where the spars cross. When the cross spars are properly assembled on the trestle, they will be standing apart where they cross. That is, there will be a few inches of space between the spars where they cross at the center of the X. To pull them tightly together, a timber hitch is used to start the lashing. As the timber hitch is pulled tight, the spars are sprung together. 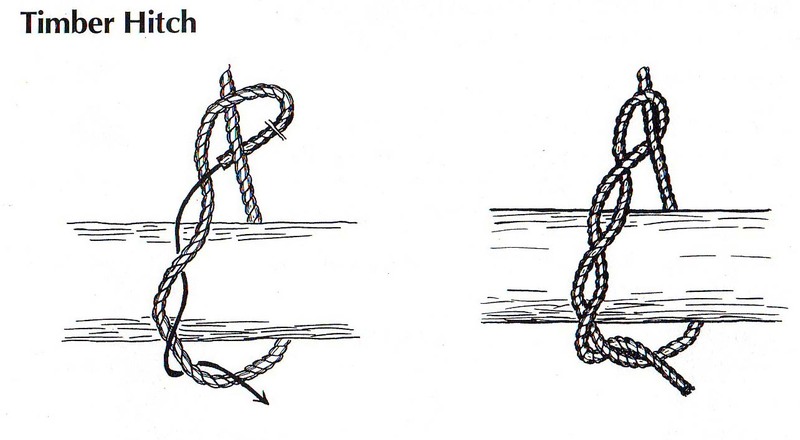 The timber hitch is a knot that can be tied quickly. As strain is put on the rope, the knot gets tighter, yet it remains easy to untie. To tie a timber hitch, first wrap the running end around the timber log or spar. Then loop the running end around the standing part of the rope, continuing to wrap the running end around itself a few more times. This will form a hitch that will tighten on the timber as the rope is pulled. After the timber is dragged or hoisted into position, the timber hitch is easy to untie. A note about this final half hitch: when using the timber hitch to lift or pull an object, that added half hitch combined with the timber hitch forms what has been referred to as a Killick Hitch. John Sweet in Scout Pioneering suggests this combination when making a lobstick to throw a line over a branch. The Killick Hitch is also known as a Kelleg Hitch. The timber hitch is most always exampled as the first step in tying the combination.